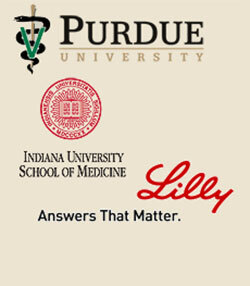 The Indiana MS-Graduate Training/Residency Program in Laboratory Animal Medicine is a cooperative program between Purdue University, Indiana University School of Medicine, and Eli Lilly and Company. The objective is to prepare veterinarians for careers in Laboratory Animal Medicine through a three year MS graduate student/residency program. The program is recognized by the American College of Laboratory Animal Medicine (ACLAM) as one that meets the training requirements for specialty board certification. ACADEMIC RECOGNITION: Trainees earn a non-thesis Masters of Science Degree upon completion. ACCESSIBLE: Indiana is located in the heartland of the USA. All four institutions are located within a 100-mile radius. COMPREHENSIVE: Methods of instruction consists of a combination of didactic training, directed projects, and hands-on experience with all of the principal laboratory animal species, including primates, mice and other rodents, farm animals, small animals, as well as many others including fish, amphibians, and avian species. DIVERSE: Training is provided at four different institutions, each with a unique staff and mission. These missions include basic medical research, veterinary research, production of research animals, production and care of animals in a farm setting, pharmaceutical discovery, and pharmaceutical safety testing. MULTIPLE MENTORS: Several ACLAM diplomates as well as several diplomates of the American College of Veterinary Pathology (ACVP) participate in the training program. UNIQUE: Multi-institutional program with both academic and corporate participation.